I keep seeing lots of adverts and reading in the press about the latest beauty wonder product, Blemish Balm cream. 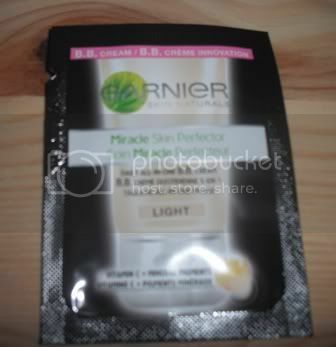 It's designed to even skin tone and lighten any blemishes. As I always seem to opt for that extra few minutes in bed I thought this could be a great addition to speed up my morning routine, combining skincare with make-up in an all-in-one product designed to give a flawless finish. When I saw Garnier were offering a sample of their Miracle skin perfector B.B. cream I immediately signed up and was pleased when it arrived a few days later containing 3 sachets of the product along with a voucher for £1 off your next purchase. The product claims to give even coverage, illuminate, hydrate and protect the skin with SPF15. Each sachet contained plenty for one application meaning I could try it out on 3 different occasions. The cream appeared to be quite thick at first, however it smoothed out on application. I requested the light shade but when blended it still left my pale skin looking rather orange which is not quite the look I was going for! I found myself having to apply more powder than usual over the B.B. cream as it made my face appear quite shiny. It was simple enough to blend but didn't really hide any blemishes. I found it to be more like a tinted moisturiser and think it would be better for using during summer when you want a light coverage. A definite bonus was it left my skin feeling smooth and able to breathe as if I wasn't wearing any make up, however I won't be throwing away my regular foundation just yet! I think it could work well as a primer as I felt as if I would need to apply foundation over the top to even out the colour, yet this slightly defeats the object of it being an all-in-one product. I would be interested in purchasing it to try again if they bring out more shades that may match my skin tone better. Garnier B.B. Cream is available in light or medium and retails at £9.99 at Boots and Superdrug. Have you tried Garnier B.B. Cream? Do you have any recommendations of other B.B. Creams to try? I love this cream, i too had some samples. My husband commented that i looked glowing and he didnt even know id used the bb cream! Definately going to buy some when my usual tinted moisturiser runs out. but i absolutely lovee it it looks really nice!! 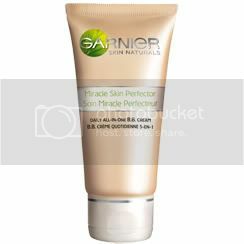 Wow, I didn't know Garnier was doing BB Creams now! That's fantastic! I've been wanting to try BB creams forever, especially because they're all the rage in Asia. It's been hard getting some for me though because I never know what skin tone/shade to get. I got some a few months back (not Garnier, though) and HATED it. I do hope they bring this out in the US so I can try! i think i should try that!